According to Portuguese history- Quiteria was a nontuplet. Yup. That’s what it says- her and her nine sisters were born all at the same time in the 5th century. They were: Eumelia, Liberata, Gema, Genebra, Germana, Basilissa, Marina, Vitoria, and Quiteria. Their mother was so repulsed that she had given birth to nine babies, like some sort of farm animal, that she ordered her maid to drown them in the river. Their father, an important Roman military official was unaware of their birth. ok. The maid did not drown the sisters, but brought them to a village to be raised together. When they grew up, the sisters opposed the worship of the Roman Gods and started a sort of warrior gang. Supposedly… their father recognized them as adults and ordered them to marry Roman officers, when they refused, the girls were imprisoned. The girl-gang escaped and waged a guerilla war against the Roman Empire. 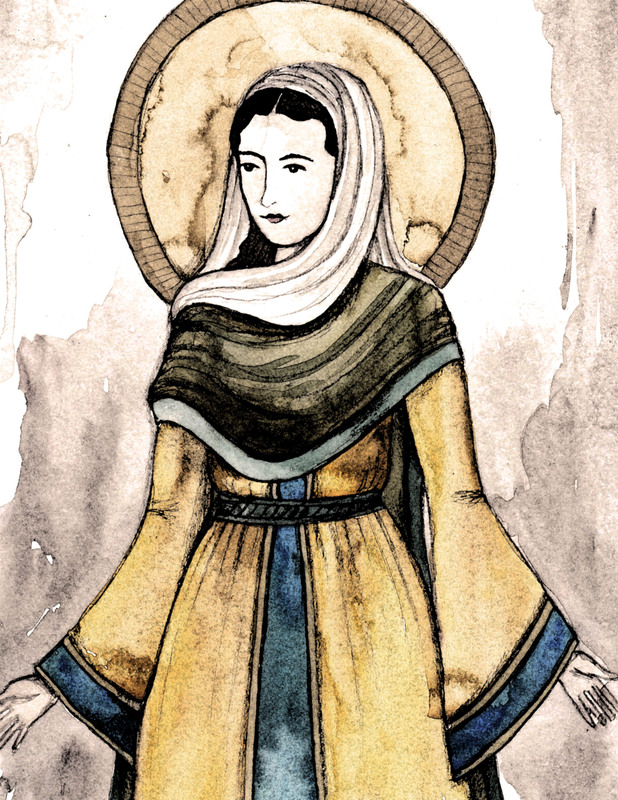 Quiteria was captured and beheaded and along with two of her sisters, Marina and Liberata, was canonized as a Saint. Her feastday is May 22. Another legend claims that she was thrown into the sea and emerged from the water with her head in her hands. She is not considered one of the Cephalophores (greek for “head-carrier”- a saint who is generally depicted carrying his or her own head) because there is no written record of this. Her patronage against rabies stems from the legend that says she held two rabid dogs at bay with the power of her saintly voice. Interesting. I took some liberties with this portrait of Quiteria- mainly I chose to paint her head where it belongs.